I am trying to create reservations on the calendar. I have enabled the building for scheduling, I have permissions at the stake and ward levels and I have assigned it a time zone (-8:00). I click the add reservation button, and fill out the requested information. I click save, and the reservation calendar reappears with a green banner (reservation has been saved). However, the reservation does not appear on the calendar. I have tried this with multiple browsers (IE,FF,GC,OP) and at a few different times (3 times in the past day). Is there a known issue? xenoz wrote: I click the add reservation button, and fill out the requested information. I click save, and the reservation calendar reappears with a green banner (reservation has been saved). However, the reservation does not appear on the calendar. I have tried this with multiple browsers (IE,FF,GC,OP) and at a few different times (3 times in the past day). Is there a known issue? Adding reservations works fine for me on Firefox and Chrome. When you say "the reservation does not appear on the calendar," are you speaking of the reservation calendar (the calendar display that shows up on the Reservations tab under Settings)? If you are instead talking about the main calendar, then that is not surprising -- reservations don't appear there (except when location checkboxes are checked in Week View). the date and time you are selecting for your reservation actually appears on the calendar. Note that in Month view you would have to be looking at the month (for the correct year) of the reservation you just made. In Week view it not only has to be in the correct week (for the correct year), but you should make sure that you have scrolled the view so that the appropriate time slot appears. the check box for the specified unit is checked under the "Filter by unit" section. Note that you can add a reservation for a unit, even if you are not displaying that unit's reservations because its checkbox is not checked. Your screen shot seems to rule out the first option, but the second possibility is still an open question. Since your screen shot shows absolutely no reservations, that leads me to think you might be inadvertently filtering out all reservations. You might also look at this post, which contains another theory as to why you might not be seeing a reservation you made. - I was looking at the reservation calendar, yes. - I tried the 'not seen but reserved' theory too because I had the event booked repeating weekly over 3 months and none of the events showed up in either monthly or weekly view. - The 'schedule this building' checkmark is on for the location that I am attempting to reserve. It again says that it's been booked, but does not appear. :bump: This seems to be a big bug. Is there a bugzilla application that I should be reporting this problem to? xenoz wrote: :bump: This seems to be a big bug. Is there a bugzilla application that I should be reporting this problem to? No. They are using this forum for bug reporting. I have made numerous reservations blocking out a time period on Tuesday and Wednesday evenings for Ward mutual activities. 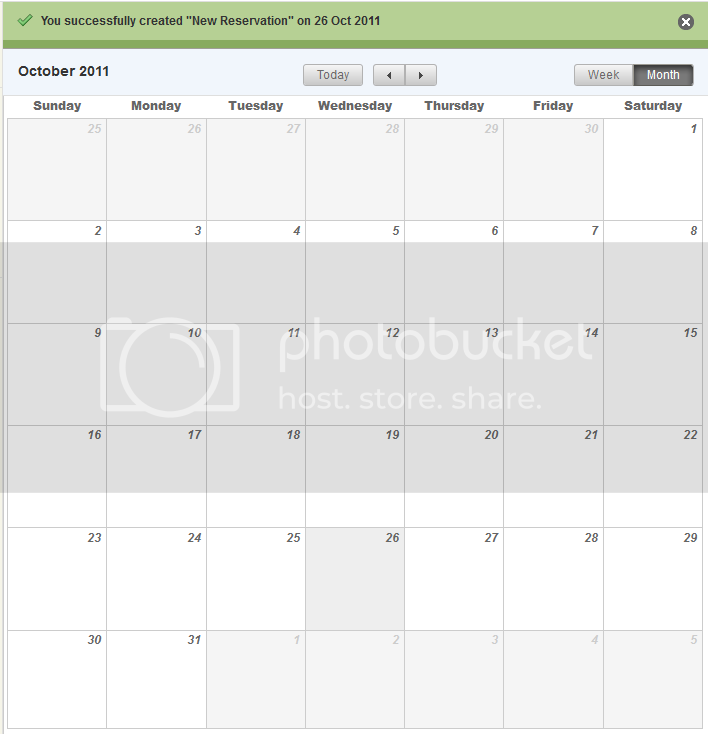 After I make them, they are not showing on the reservation calendar, as shown if the other entry above. I receive the green bar saying the reservation is successful also. One item I read in these recent threads also mentioned the ability to have a choice of clicking on, or seeing, the different Locations in the actual Calendar (as was the choice in Ver1). I don't see that choice in my calendar. FYI: I generally use Safari browser, and I am on OSX Lion. This may be the same issue reported here. Saving Repeating weekly reservations doesn't work. But it appears you can make a single reservation and then edit it into a weekly repeating. RussellHltn wrote: This may be the same issue reported here. Saving Repeating weekly reservations doesn't work. Well, that statement is definitely far too broad. Lots of people can save weekly reservations. I just did it again 2 minutes ago and had no trouble at all. There may be some specific situations where some people cannot save some weekly reservations, but if there is still a problem (I have not seen any problem in this area since V2.0.1 was released), it is not as general as you stated.